By Felicity Arbuthnot: The mention of one tiny country appears to strike at the rationality and sanity of those who should know far better. On Sunday, 6th August, for example, The Guardian headed an editorial: “The Guardian view on sanctions: an essential tool.” Clearly the average of five thousands souls a month, the majority children, dying of ”embargo related causes” in Iraq, year after grinding year – genocide in the name of the UN – for over a decade has long been forgotten by the broadsheet of the left. A bit of perspective: 27th July 2017 marked sixty four years since the armistice agreement that ended the devastating three year Korean war, however there has never been a peace treaty, thus technically the Korean war has never ended. Given that and American’s penchant for wiping out countries with small populations which pose them no threat (think most recently, Afghanistan, Iraq, Libya) no wonder North Korea wishes to look as if it has some heavy protective gear behind the front door, so to speak. Tiny North Korea has a population of just 25.37 million and landmass of 120,540 km² (square kilometres.) The US has a population of 323.1 million and a landmass of 9.834 MILLION km² (square kilometres.) Further, since 1945, the US is believed to have produced some 70,000 nuclear weapons – though now down to a “mere” near 7,000 – but North Korea is a threat? “We went over there and fought the war and eventually burned down every town in North Korea anyway, some way or another …”, boasted Lemay. Gen. Douglas MacArthur said during a Congressional hearing in 1951 that he had never seen such devastation. “I shrink with horror that I cannot express in words … at this continuous slaughter of men in Korea,” MacArthur said. “I have seen, I guess, as much blood and disaster as any living man, and it just curdled my stomach, the last time I was there.” (CNN, 28th July 2017.) Horrified as he was, he did not mention the incinerated women, children, infants in the same breath. In the North Korean capitol, Pyongyang, just two buildings were reported as still standing. North Korea has been taunted by the US since it lay in ruins after the armistice sixty five years ago, yet as ever, the US Administration paints the vast, self appointed “leader of the free world” as the victim. This month “massive land, sea and air exercises” involving “tens of thousands of troops” from the US and South Korea began on 21st of August and continue until 31st. ‘In the past, the practices are believed to have included “decapitation strikes” – trial operations for an attempt to kill Kim Jong-un and his top Generals …’, according to the Guardian (11th August 2017.) The obligatory stupid name chosen for this dangerous, belligerent, money burning, sabre rattling nonsense is Ulchi-Freedom Guardian. It is an annual occurrence since first initiated back in 1976. US B-1B bombers flying from Guam recently carried out exercises in South Korea and “practiced attack capabilities by releasing inert weapons at the Pilsung Range.” In a further provocative (and illegal) move, US bombers were again reported to overfly North Korea, another of many such bullying, threatening actions, reportedly eleven just since May this year. 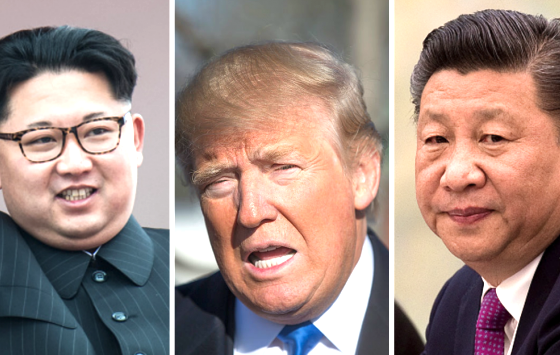 There are in fact, twenty four diplomatic missions in all, in North Korea through which the US could request to communicate – or Trump could even behave like a grown up and pick up the telephone. Siegfried Hecker is the last known American official to inspect North Korea’s nuclear facilities. He says that treating Kim Jong-un as though he is on the verge of attacking the U.S. is both inaccurate and dangerous. Trump made his crass “fire and fury” threat on the eve of the sixty second commemoration of the US nuclear attack on Nagasaki, the nauseating irony seemingly un-noticed by him. Will some adults pitch up on Capitol Hill before it is too late? Felicity Arbuthnot is a British freelance journalist who visited Iraq dozens of times since the 1991 Gulf War. She has written and broadcast widely on Iraq, one of the few journalists to cover Iraq extensively even in the mid-1990’s during the sanctions and reported on the devastating effects that took place prior to America’s attack that killed over one million civilians. Felicity also worked as senior researcher on John Pilger’s film “Paying the Price — Killing the Children of Iraq”, which investigated and told the story of the devastating effects of the United Nations sanctions on people of Iraq.